It's getting harder and harder for me to try and express to everyone back home just how much of an impact Africa has had on me after three months. It's been significant. Everyday I wake up, and I know I am lucky. Lucky because I had a bed to sleep one, lucky because I have enough food to eat, and lucky because I have the means to travel and study in different countries. It is obvious. These are things that so many of my current neighbors are not privy to. I don't know how I will go home in three weeks, and keep living my life with the same scope on the world that I left with. I can't, its not possible. When I go home I will wake up and think how lucky I am to have a shower, toothbrush, and a university to attend when so many of my old neighbors had none of these things. After four months in Africa and I will go home, and I think the only option I have is to do my best to change some of these circumstances. How can I not at least try? How can we not at least try? Monitoring the status of arid and semi arid landscapes is important in understanding the implications changing ecosystems have on local livelihoods, natural resources, and the environment. Range condition and trends in Mbirikani Group Ranch, Kenya were determined through a field based assessment and household interviews with local community members. The field assessment characterized woody vegetation density and crown cover, herbaceous cover, herbaceous species composition, forage potential, and soil erosion within settled and unsettled sites. Although woody vegetation densities were statistically similar between the study sites, average crown cover was significantly greater in the unsettled site. Herbaceous cover and the herbaceous vegetation types were statistically similar in both sites; forbs and increaser II were the most dominant vegetation type, and forage potential was low in both study sites. Soil erosion was statistically similar between sites, and sheet erosion was the most prevalent erosion type in both sites. The settled site had a medium potential for erosion while the unsettled site had a low potential. 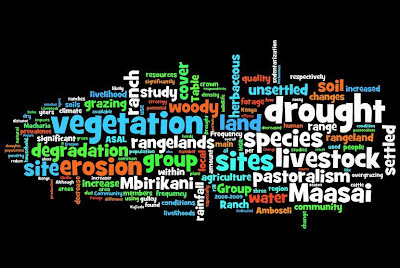 This study concluded that rangelands in Mbirikani have been degraded by humans and an increase in the frequency and intensity of drought periods, which is significantly depressing local livelihoods and increasing the prevalence of poverty. 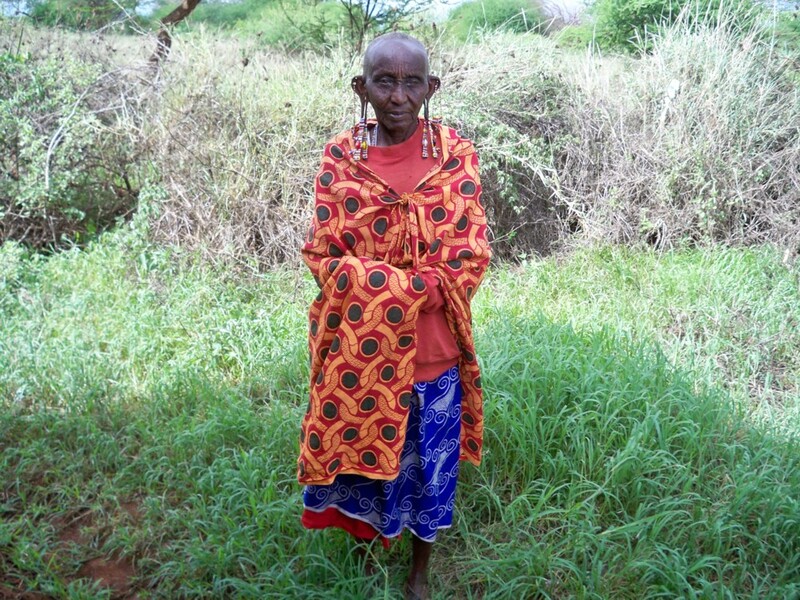 In response, Maasai are abandoning pastoralism and adopting agro- pastoralism as their main livelihood strategy. 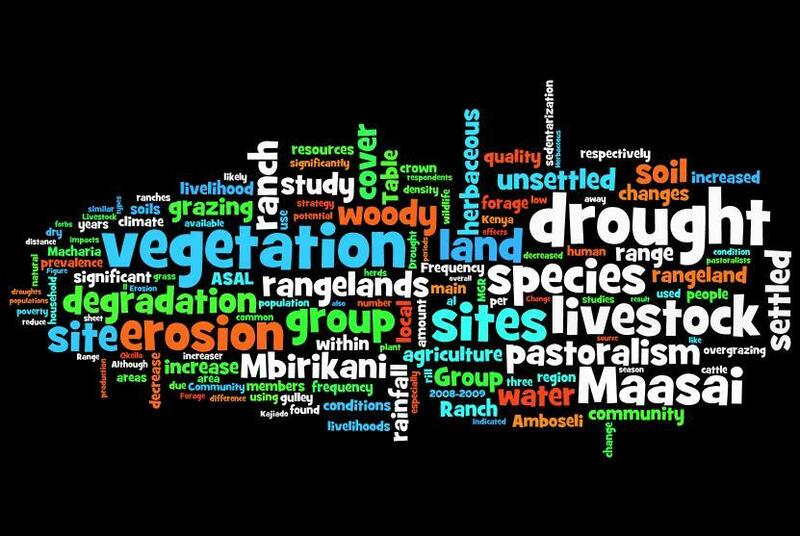 If range management strategies do not improve the condition of the group ranch, it is likely that pastoralism will be replaced with the unsustainable land use practices, especially agriculture, causing extensive deterioration of the entire Amboseli ecosystem. The Most Commonly Used of the 15,000 Words in My Report. Today we finished our research projects by having a community presentation. Over 130 members from the various Group Ranches in Loitokitok District came to listen to three presentations regarding rangeland degradation, the viability of wildlife sanctuaries, and pastoralism as a sustainable livelihood in this region. It was astounding. The presentations took 4 hours because the community had so many questions to ask about our topics, meaning that they were very interested in our research. The presentation was followed by a meal in which I was able to say goodbye to so many of my friends, and local guides from our research who came out to hear about our results. It was a tiring afternoon, and the entire research project has been a tiring process and I for one am glad that it has come to a close. Program: Fall 2010. Tanzania/Kenya Group I. 1. What did you like most about the SFS experience? It is a unique and fortunate opportunity to participate in a study abroad program of any kind. The advantage of SFS is the diversity of experiences it provides to its students. After my three months in E. Africa I have done things I never thought were possible: building a see-saw for an orphanage, reading weekly with primary school students, home stays with local families, and even participating in challenging and interesting research. What I liked best about SFS is that it provides passionate students with a forum, location, and contacts they can use to make dreams come true. 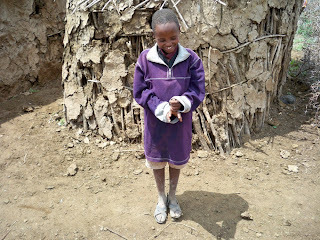 Without the help of SFS I can confidently say that I never would have started a relationship between American students and a primary school in Tanzania, helped to build a kitchen, or even help start a community food relief organization. 2. You’ve been in the country for a full semester- tell us your impressions of it now. I think one of my American friends in Tanzania said it best that the longer you stay in E. Africa, the more confusing life seems. As someone who has never been to Africa or a third world country, I can say that my experiences here have consistently become more random and amusing. The people and culture here have taught me that it is important not to take life too seriously, but it is also important to take seriously the people you love. 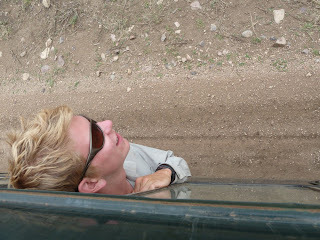 I have never felt more comfortable and welcomed than during my three months in Tanzania and Kenya. The people here have a way of making you feel like a part of their family after only a few minutes of meeting them, which is something I hope to take back with me when I return home. 3. What is life at the center really like? 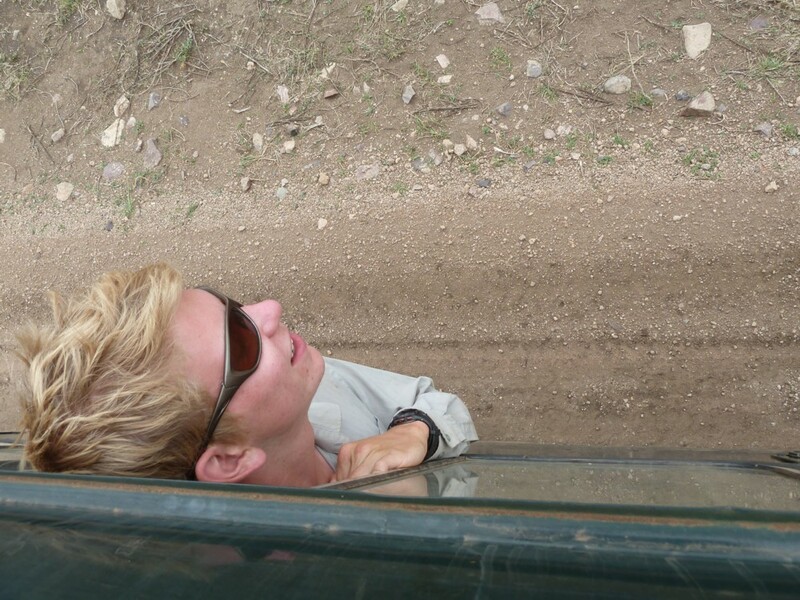 What are the best and most challenging parts of living at a remote field station? The field station have a way of melting days together to the point that three days feel like they have only been one; time flies! It can be difficult being confined to camp boundaries for multiple days, but enough activities take place outside of the camp where there is always adequate opportunity to stretch your legs. The best past is waking up every day with forty of your friends, and some of the most interesting and unique people I can guarantee you will ever meet. SFS has done a phenomenal job hiring their staff, and every day you will interact by drinking chai, playing soccer, and simply talking. I have learned so much from the staff here, and I can say that they have been a critical part in my enjoyment of this program. I don’t know when I will ever again eat three meals a day with fifteen E. African men, only to learn from and joke with them about life. 4. What ended up being your biggest challenge thus semester both academically and culturally? My biggest challenge was pushing myself at times to finish my assignments and especially my research project. It is only inevitable that you will become overwhelmed and tired (like in any university) from the workload, but it can be easily managed, especially when breaks for kicking a football around are provided. Culturally I struggled with trying to learn both Kiswahili and Maasai languages. After leaving Tanzania I felt like I had a solid handle on Kiswahili, and that I could communicate easily with just about anyone. Coming to Kenya was difficult because it was like starting from square one all over again, as I was confronted with a new and challenging language to learn. But as they say here “Kidogo kidogo hujaza kibaba”, a little bit and a little more fills the cup- it’s possible. 5. What is your best memory you have from this semester? Give some highlights. My highlights include any time we interacted with the local communities- from spending time in schools and orphanages, to merely walking around towns and markets, the things I have seen and the people I have met blow my mind. It’s something I can’t possibly forget. One day in Tanzania in particular sticks out in my mind. A few other students and I walked to the close by primary school to read and play soccer. As we approached the sound of screaming and laughter met us, closely followed by what seemed to be the entire school. They playfully grabbed at our hair and laughed at our skin, while holding our hands and leading us to the classroom. As we entered this classroom, the thirty students rose in unison and said “Welcome teachers! And thank you for coming!” I couldn’t have asked for a better welcome. 6. Give three adjectives that best describes how you are feeling right now.Nervous, fulfilled, and loved. This is exactly what I was referring to at the beginning of this blog when I said I am going to work my hardest to change a few of the unfortunate circumstances I have witnessed from being here. Only 60$ (US) per month will provide a orphan with enough funding to eat healthily and attend school. In America I will be doing my best to promote the issues in E. Africa, and this CBO as to raise funds for the children. My hope is to have enough passionate people donating $5- $10 per month that it will meet all the needs. More information will soon be provided, so if you are interested in "Adopting a Child" please keep it in the back of your mind and contact me when the time is right. Like I said before, how can we not at least try to help those who need it most? I feel like this responsibility is pressing and MUST be addressed by every American citizen. An Orphan Named Parashino. Her mother died from Meningitis. On Saturday we will travel to Nairobi, and from there I will leave SFS and take a bus to Arusha. Then my 6 day climb of Mt Kilimanjaro will begin. Afterwards, I will meet up with my family and travel to Dar Es Salaam, TZ, to Zanzibar Island, TZ, then to Mombasa KY, back to Nairobi KY before we return home on Dec. 29. This means that this will be my last post for a while, and next time you hear from me I will be back in America. I want to extend a huge thank you to everyone who has read this blog. Writing down all of my experiences here for you has helped me to internalize them, and understand everything I have felt here even more than I would have. THANK YOU THANK YOU THANK YOU. I know many people following this blog were the ones who financially helped me get here, and to you I also want to say a million thank yous. This experience has meant so much to me, and I can't remember a 3 month period when I have learned more or given back so much. Thank you for making a difference in my life. Finally, my return to America will follow a presentation/ stories from my trip which will take place in Spokane, WA (time TBD). It will also involve the release of a film following and documenting my time here. I will post a blog as a reminder when this time comes, and I hope to see you all when it happens.